Cyclists in the City: Blackfriars - TfL simply isn't listening. We're still stuck in 2004. Can a two-minute Stop Cycling Friday every week change that? Blackfriars - TfL simply isn't listening. We're still stuck in 2004. Can a two-minute Stop Cycling Friday every week change that? In 2004, this post appeared on the Indymedia website. 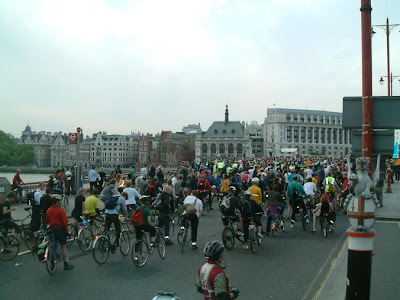 700 people on cycles took to Blackfriars Bridge to protest the death of Vicki McCreery killed cycling here. The author spelt out exactly who he felt was to blame: "Another cyclist was killed on the same spot in February 2003 yet the transport authorities still refused to listen to local cycling groups. Their attempts to cater for the surge in cycling following congestion charging have been token gestures of their incompetence and ideological commitment to keeping more motor vehicles moving". Fast forward to 2011 and once again, cyclists take to Blackfriars Bridge in protest (the full timescale of events is here). The wording may be different (this time the terminology is about 'smoothing the traffic flow') but the issue is the same. Cycling and walking is marginalised by an ideological commitment to keep more motor vehicles moving, as quickly as possible. This despite the fact that, once again, cycle use is surging on this bridge and cycles are now the largest single type of vehicle on the bridge at both rush hours. To prove just how little Transport for London is listening to people who want to cycle and walk here, you might want to follow this exchange of emails between one cyclist via his Assembly Member (Conservative, as it happens) and Leon Daniels, the man who is the boss of London's roads. And the man who suggests there is no safety benefit in giving cyclists space and room on London's roads. Question: "turning right into Queen Victoria St, northbound, or onto Victoria Embankment southbound involves filtering across two lanes of fast-moving traffic. It's a dangerous and difficult manoeuvre on a bike, and most people will just avoid doing it." Initial answer from Leon Daniels, head of surface transport at TfL: "Taking all users into account we believe the proposals are equitable and safe. Dominic comments on the safety of the right turn for cyclists - this is in fact one of the key features of the scheme and they are protected by traffic signals when they do this." Mr Daniels is talking here about the newly installed filter allowing people to cycle up from the Embankment and turn right on to the bridge, which he describes as a 'key feature'. In other words, on a first reading, he hasn't even realised that very few cyclists make that manoeuvre and that very many more are concerned about a different crossing, namely where thousands of them turn towards Bank junction and into the City of London, not away from it and over the bridge. By adding an extra motor traffic lane will make it terrifyingly difficult to turn right into the City. After nearly 600 individual letters to TfL, motions in the London Assembly, a petition of 2,000 further signatories, he doesn't seem realise this is one of the key issues with Blackfriars. "In these cases [turning into Queen Victoria Street] the manoeuvres do involve some filtering with the traffic which is not uncommon of course but we are providing Advance Stop Lines across the width of the road to give cyclists an opportunity to get into position safely. I should also have said that at peak times the average speed across this junction is below 20mph anyway so hopefully ensures all users are properly respecting each others' requirements." Firstly, there is no Advanced Stop Line on the plan at this point. Secondly, even if there were, it would be inaccessible to cyclists unless they want to cycle down the centre of a newly installed middle lane of traffic accelerating away from the bridge. And third, his response implies, if you're not commuting at the office hours we deem to be commuting time, you'll just have to play chicken with the fast-moving traffic. Dozens of people contacted me after my post yesterday and the comments on yesterday's article all suggested one thing: That lots of people are fed up with playing second-fiddle to people in motor vehicles who want just as much right to the road as those people in motor vehicles. And that they don't think the Mayor is listening. No-one's an 'anti-motorist'. This isn't a war against the motorist. It's a battle to have an equality of right to the road and a battle to feel that the Mayor and his transport authority attach the same amount of importance to the safety and convenience of people walking, cycling, using mobility scooters or wheelchairs, as they do to people using motor vehicles. Andrew Boff, Conservative Assembly Member put it better than me last week when he said "it's not just about recognising the [private motor vehicle] capacity of the road any more. It's about the thought that goes into the people using that junction, it's about how people use that junction." TfL doesn't seem to agree. A lot of cyclists are very passionate about this junction as a symbol of all that's wrong with TfL's policies. They took to the streets in 2004. And again in 2011. I felt very ambivalent about the Flashride on Blackfriars a few weeks ago and stated so. I'm not a great fan of blocking other people on their way to work, just because they're on a bus. I don't have a particular beef against taxi drivers or private motor vehicles. My beef is with the Mayor and TfL, not the bloke trying to get to work in his van or the woman on the bus. I'm also left feeling a bit flat by the idea of yet another petition. If the last one, plus 600 letters, plus countless communications with Assembly Members hasn't worked, then another petition feels a bit jaded. So my suggestion is a bit different. It's called Stop Cycling Fridays. It's simple. On Friday mornings, every Friday morning, cyclists should stop cycling for two minutes, pull to the side of the road and spend two minutes in silence. They shouldn't put themselves or anyone else in danger, nor block the carriageway. Simply stand in silence for two minutes at 8.30 every Friday morning starting 1 July and think of the people killed and maimed in London by traffic. And they should think of how Transport for London is choosing to design London's streets in a way that makes them more dangerous and less convenient for walking and cycling while making them faster and more convenient for motor vehicles. Think of how those policies feel to people knocked from their bikes, the pedestrians and cyclists run over by cars, driven at by aggressive or speeding motor vehicles. It's not about being anti-car. It's about paying respect to those people and about making a statement that is open for anyone to join, whether they're on a cycle, on foot or simply curious. So how about it? Stop Cycling Fridays. Starting 1 July. Every Friday. Wherever you are, pull off to the side of the road and remember. At 8.30am. In honour of those people killed and maimed on London's roads. And in the hope of forcing our Mayor and TfL to drop their insatiable desire to keeping more motor vehicles moving faster, in favour of making it just as safe and convenient to cycle and walk on London's roads as it is to sit in a motor vehicle. That's the ultimate goal: To get the Mayor and TfL to drop their transport priority of 'smoothing the traffic flow' and to replace it with treating London's streets as places for people to get about on cycle or on foot just as safely and just as conveniently as they can by car. I'll be stopping on Blackfriars Bridge, 8.30am, 1 July. For two minutes by the side of the road at a point where I know there are hundreds of cyclists. If I'm alone, it might be time to declare TfL has won the battle and the war. If people stop for two minutes wherever they are - ideally in a spot where they know there are plenty of other cyclists - perhaps we'll lose the Battle of Blackfriars but we might start getting our point across instead. Perhaps I'm being utterly naive. I don't really know but I'm very interested to know if other people want to try and change things by participating. How is this supposed to achieve anything? While great for your spiritual wellbeing I don't think reminiscing dead cyclist, while quietly stopped on the side of the road will actually have any effect on TfL or the Mayor. I am amazed that after so much time, and you being the one that flagged it all up, you are still calm and patient enough not to suggest burning tyres (bicycle tyres of course) in front of TfL HQ. Yet any action will fail if there's not a strategy (yes I know I am repeating myself) to challenge the designs created. A great addition to the pictures which are supposed to be put on Blackfriars, would be boards explaining to everyone walking or cycling what it's all about - what the design is going to be at the moment, and what it should really like. I don't think people awareness is really that high, yet. Then a flashride and a march of pedestrians every day for a week. Then mass picketing of TfL and BoJo's HQs - everything to show, that we are not letting it go. But for this we must come prepared - with a ready design that we want to see. The question is whether it is even possible for the LCC or anyone else for that matter, to design something most people would back. And it needs to be visionary and along Dutch guidelines! Because as many have said - this isn't about Blackfriars, this is about the design template that is used all over London. If we are to challenge this - let's not focus on "Keep it 20". very difficult to demonstrate without being disruptive, not sure you should try. Just keep it clear of working hours and start burning tyres. Failing that get living streets on board and as suggested above put forward a design that reflects 1/3 of the road space given over to cycling. I like the idea of not blocking traffic but making a visual and people statement. I'll be there. I wonder whether we are trying to be too nice? Anything you propose has to be legal – many of us working in regulated professions simply cannot risk having to disclose on our annual fit&proper confirmations that we have a conviction for anything (except, ironically, “minor” motoring offences) – but with that proviso perhaps we should actually make more of a nuisance of ourselves? I read the other day that the Licensed Tax Drivers’ Association is contemplating direct action such as go-slow processions in protest at the Olympic Zil lanes . It might be interesting to see what kind of reaction they get. how about a 'go-slow' back and forth over the bridge (or round vauxhall, or elephant and castle)... that's legal, right, as long as we keep moving? My concern with a go-slow is we've done so many of them. Blackfriars had one a couple of weeks ago. There was one in 2004. I'm not sure what they achieved. As for something more radical, to Paul's point, many of us can't afford to do that for professional reasons. Especially in the CityofLondon. But I think that sending nice petititons also isn't working. And I'm trying to encourage people to find a way to protest that gets noticed. And that gets lots of people's support, not just 500-700 or so. Certainly a heartfelt post Danny. As Paul correctly pointed out, getting plenty of people along to anything seen as even mildy radical is a difficult thing indeed. I think your 2 minute idea is very noble, and anything that helps to raise awareness of the issue is a good thing. I will certainly also take part. You're right that the endless petitions are a bit toothless. What we need is to find a way to combine all these actions in to one big media-friendly stunt - maybe print the 2000 signatory petition out, along with all those photos the LCC are collecting to turn in to something physically visual and combine this with an action that doesn't piss everyone on the Bridge off but also is powerful and photogenic. I suppose the point I'm trying to make is that we need ALL these things to keep hammering home the point (and it's a very big point! ), but it needs to be well co-ordinated so it is as big an action as possible. i think the question is, what will make enough noise to get into the media (which is the point where politicians start to take notice)? i am not sure the go-slow (or some variation, for novelty) is such a bad idea. there's more political momentum than last time. and it shows numbers, in a way that stopping at the side of the road doesn't. (people will just think, oh, a cyclist, stopped - unless there are hundreds in the same place).. The best way I can put it is like this: "Stop cycling for two minutes, and inconvenience the one other transport group (pedestrians) who we should be lining up with." A few hundred cyclists randomly scattered among the 8 million population of London, standing quietly for two minutes on a friday morning. I don't see how this will achieve anything. To get attention you have to do something out of the ordinary. The flashride a few weeks ago was good start. But for every cyclist that took part there must have been 5 more who passed the initial gathering and continued across the bridge anyway, wondering what was going on but not giving it a second thought. Not everyone reads these blogs... To get more attention we need to cause a nuisance again, although I agree it shouldn't be in a way to cause significant annoyance to other road users. How about every friday we have a 'coordinated commute'. Instead of the flashride that annoyed other road users, we get as many people commuting by bike to coordinate their journey to cross Blackfriars at 8:15. That way we are just traffic, but enough of it at the same time to cause a bit of a nuisance and visibly assert our rights and viewpoint. Every friday a few people would hand out leaflets at the traffic lights before the bridge between 8 and 8:30 to raise awareness and hopefully get more people to join in. The eventual tailback of people on bicycles waiting to get onto the bridge would be quite a sight. From tomorrow and every friday from now on I will time my commute to cross Blackfriars at 8:15. Who's going to join me? If you want to make an omelette, you've got to break a few eggs. Cyclists have been playing nice for at least 20 years (how old is the LCC?) and its got us a few platitudes and nothing more. Surely it's time to at least try some direct action? the coordinated commute is not a bad idea. but maybe meeting at the pub from 8.15 to cross the bridge together at 8.30 (to ensure some bunching)? For a coordinated commute we could even try and raise awareness on adjacent bridges, where cycling rates are quite high as well - especially Southwark Bridge with CS7. It wouldn't take much for people to alter their route a little bit and join in. As and additional measure to the ones I mentioned earlier how about a cycling counter. We could easily make one out of cardboard. Plus a counter of buses, cabs and private motors. I appreciate it would take some people to actually count, but would make a nice impact. There are lots of great ideas coming up here and on other blogs. Has anyone on any of the blogs about Blackfriars produced a pdf leaflet which anyone can print and hand out to cycle commuters on this and all bridges in London? (like the ones which explain Critical Mass to bystanders.) If someone were to design a standardised one with the key issues and how to address them with AMs, TfL etc and distribute it to all the London cycling blogs & forums for commuters to print and hand out to other every day it would soon spread the word. It could be used in the context of a mass demo or just individual's daily commute. If such a leaflet already exists, please could someone tweet me a link (@bryonyevens) and I'll pop it on my blog & spread the word further. Blimey. The intention of putting up a two minute idea was because I couldn't think of anything else. And i'm delighted that people are suggesting other ideas that might work. The coordinated commute one strikes me as potentially workable. Not only on Blackfriars though. On southwark Bridge, 43% of the traffic is bicycles during rush hour. And on Chelsea Bridge its 42%. Whatever it is, this thing needs to be clear enough, concise enough to grab attention of the many cyclists. Ive stood on Blackfriars several times to hand out leaflets or talk with people. I've done that on my own and with others. On average 1 person in 5 stops and I don't know how many of them take it in. So, something that will motivate everyone, all the people on teh blogs, on the forums'but also all teh people who don't blog or post about cycling too. Coordinate commute stands out to me so far. Critical Mass but a rush hour and without the music perhaps. By the way, Bryony, what's your blog? is there any way we can arrange a meeting between cyclists and mr daniels? if he truly doesn't understand the problem (as it appears) perhaps a bit of re-education (and, even better, a short ride on hire bikes) might help? Mr City says: "My concern with a go-slow is we've done so many of them. Blackfriars had one a couple of weeks ago. There was one in 2004. I'm not sure what they achieved." So... we've only done *two in eight years*? Let's do a go-slow every week for a couple of months, and see what happens then. If that doesn't have any impact, *then* we can say that go-slows don't work. And back on the other hand again: whether or not we can figure out how to get non-cyclists involved, we still need to get out there and demonstrate *somehow*. Cyclist-only demonstrations are still a lot better than no demonstrations. And I think demonstrations have to be what we're talking about. Critical Mass style. Or like the go-slow over Blackfriars a couple weeks ago. But in the morning rush hour, regularly, and frequently, so that more and more people hear about them and join in the following week, so that the whole thing snowballs into something TfL and Boris can't just ignore or dismiss. Question is: how do we get started? Inviting people from TfL to ride the bridge is a great idea in my opinion. Let's publicly invite them, so if they decline it's plain for everyone to see that the road is dangerous for cyclists (like what Ed Pickles admitted earlier this year). Let people from TfL cycle outside of the rush hour so they can appreciate what it's like. And take them in all directions so they can see the problems themselves. In my opinion the key is to involve many different groups of people and get media attention - then fry pooliticians in this fire. I'd love to ride across the bridge every Friday with a lot of other cyclists. It was great fun last time, and one of the few times in London where I have felt safe and un-marginalised. If the LCC or Cycling Embassy of GB got behind this, organised material, and drummed up support form media I'd happily start paying them a membership. Inviting, and making sure they keep their appointment, all politicians with the power to change things to ride across the bridge would be a good idea. You'll struggle to do it, and one person is not enough. Even though you feel that petitions have not made a difference were were within inches of getting the LA to support us and hold Mr Johnson to account. We need to make sure those in power don't forget about us, that they need to accommodate us or they will be pointed out and ridiculed. I'm all for doing this every day of the week until this gets noticed, I'm massively inconvenienced every time I go out on my bike by unpleasant and dangerous drivers who can literally get away with murder using a SMIDSY excuse. As well as go slows on the bridge the TFL building is an obvious target, surround that with bikes, create bike pinch points, do close overtakes, make them walk in 18" of glass filled gutter show them all the unpleasant conditions for cycling that they have created inside TFL. Coordinated commutes - "How do we get it started?" We just go ahead and do it! I'll be cycling across Blackfriars Bridge at 8:15 tomorrow morning and every Friday morning until this issue is resolved. I'll be asking everyone I know who could take part to join in, but I have limited social impact. If other people like the idea and want to join in and spread the word through their own blog and twitter networks, then great! If I'm early I'll wait where the flashride started from. The intention for me is not specifically to hold up other traffic, but eventually to create so much simultaneous bicycle traffic that it becomes a problem for motorised vehicles. I really like the idea of a bicycles/vehicles/pedestrians counter, which will also be a great novelty item to grab the media's attention. Not sure where to begin with organising it though! Anonymous - greatidea to repeat the flashride every Friday or even every day. The thing is before we do anything let's come up with a design that we really won't otherwise we are just wasting ammunition here. Not bad indeed. I would only get rid of those separating islands and raised the cycle tracks instead. This would provide more room for cyclists as well as reduce the speed of cars (removing the centre island). I think the design in Danny's post (7 June) has great potential. Would love to see the final few kinks ironed out and it drawn up as a "professional" plan. Is there any way to pressure TfL to put it through their traffic simulator to test it? unfortunately, their traffic simulator is essentially dishonest, as it does not allow for changes in demand caused by making different modes more or less attractive. that's something else that needs to change. If you want to get attention (especially from the media) I've got two suggestions. First, get a London Assembly member to accuse Boris of misleading the Assembly with his statement that cyclist concerns have been addressed. Second, that statement says work on the junction is going to start this month. Seriously disrupting that work, whether it's by blocking vehicles or some other means, should get plenty of attention. The message should be "No, we haven't agreed to these changes, and you're not going to start anything until we do". Ok, I'm up for 8:15 at Blackfriars every Friday morning. I only just saw Anonymous's post, so I missed it this morning, but I'll be there next week. : To get more people on their bikes, what are the ‘must-haves’ in terms of cycling infrastructure? A: No city in Europe or North America has achieved a high level of cycling without an extensive network of well-integrated bike lanes and paths that provide separation from motor vehicle traffic. Bikeways are the trademark of bike-oriented cities in the Netherlands, Denmark, and Germany. Bike paths and lanes must be combined with intersection modifications such as advance stop lines, special lane markings, extra turning lanes, and advance green lights for cyclists. Physical separation from motor vehicle traffic is crucial for enabling risk-averse and/or vulnerable groups to cycle. Virtually all surveys report that separate cycling facilities are needed to encourage non-cyclists to cycle, especially for women, seniors, and children. Those traffic-sensitive groups have high rates of cycling in countries such as the Netherlands, Denmark, and Germany, with their extensive separate cycling facilities, but low rates in countries where most cycling is on roads with heavy traffic and no separation for cyclists. Separate cycling facilities are a crucial first step toward increasing cycling and making it socially inclusive. Annon 08:25 has a good point - Val and Jenny should be convinced to do that. (additionally, I FOIed for the drafts and meeting notes preceding that report section). For me an 8.25 protest isn't ever going to work, but if it works for you why not. You won't get coverage by repeating it though, it get's old and dull (unless it's getting bigger). I'd suggest taking the protest to City Hall and TFL (Palestra) instead - get in their faces, not other road users. -I think whatever is done needs to be coordinated by LCC to get the maximum reach.So probably it needs to wait until their current photo petition idea has run its course. -I think the flashride was successful and could be repeated weekly and amplified. The disruption it caused was minimal and we shouldn't be afraid of causing some disruption. This is a life-and-death issue, unlike, say, the taxi drivers and the Olympic lanes, where they are threatening to gridlock London on a mere personal business issue for them. Our cause is far better and we shouldn't be afraid of "breaking eggs"
-Thinking about the recent naked bike ride protest: what about doing the reverse? What about a protest in which a mass of cyclists cycle across the bridge all dressed in business suits? Keep doing it. Make the point about the bridge, simultaneously hitting against the media stereotype of cyclists. Striking and media-friendly and memorable, a distinctively "City of London" protest. Establish an image that "cyclists are the new establishment". I can see some practical difficulties of comfort for cyclists who commute from far away, but these could be compromised around, it needn't be perfect. Just create a new and unexpected image for cycle protest - like flashmob meets The Tweed Run. business suits and boris johnson wigs? One idea I had a while ago was a 'gran ride' - taking the idea of 'would you be happy for your gran to cycle on these roads', which was always a powerful idea, I think. I'm certainly up for diverting my commute to go-slow over a bridge every Friday. And the comments above on spreading this to Southwark, Chelsea and so on are spot on. If the LCC co-ordinated this I'm sure we could spread it to second bridge within a few weeks, and so on. I'm up for direct action. Love the idea of a 'normal cyclist' protest - I think its changing the perception of those in power to see that cycling is very normal - not just by 'anti-capitalists' as Clarkson thinks. They don't seem to care about a few crusties, but if they think the cream of capitalism are in danger then they may act. Boris wigs, dressed up as grannies, its time for cyclists to stop being marginalised, come out of the closet, stand up and be counted as one. The cabbies have threatened to shut down London over lost business opportunities - whereas we're all in danger of being killed by the current policies of TFL and the powers that be. As one poster put - its literally a matter of life and death for us. I'm really glad the LCC are starting to stand up, they know they've got a lot of support, and I can see this movement growing to actually achieve positve change. I want those that aren't so confident on bikes to be able to cycle to work and around what is essentially a very small city.